Major Edmondson testified that Thomas Allen was who he said he was as he continued to try and have his military pension raised. I do not know how they met. Perhaps they worked together. Major Edmondson’s first name was “Major”, not a rank in the armed service. He never served. The earliest that I found Major Edmondson in a record was his 1884 Marriage license. On October 8, 1884 he married Lucy Elms in Manhattan, New York. Lucy was born in Monroe, North Carolina and lived there with her mother and siblings in 1880 when she was working as a 16 year old cook. What brought the two of them to New York City? Probably the desire for better opportunities and less discrimination. They lived there until at least 1888 when he appears in the New York City Directory as a hostler, a man who looks after horses. 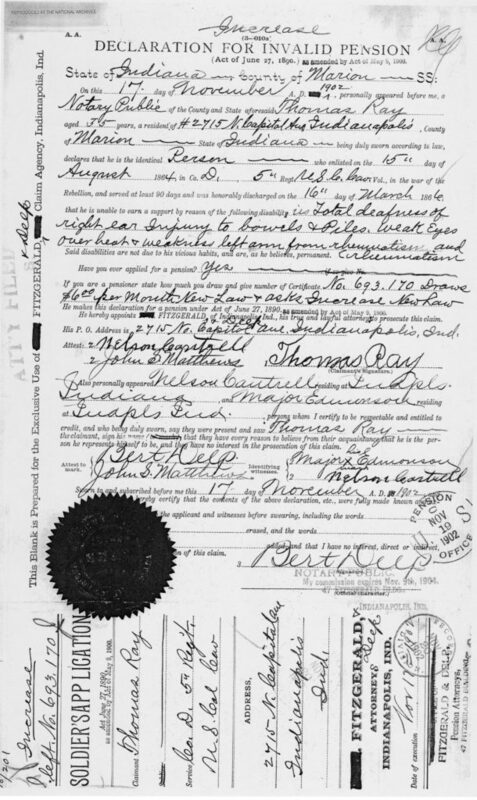 In 1889 he and his family were living in Indianapolis where over the years he worked as a laborer, usually a hostler. In 1890 his wife Lucy gave birth to their daughter Emma. She had two other children who were both dead by 1900. Lucy was literate, although Major was not. In 1900 Major was working as a hostler. Lucy was not working outside of the home. They had 8 roomers living with them. There were two married couples. They worked at various occupations, including barber, waiter, bar keeper, laborer and porter. All of them were literate. Daughter Emma attended school and could read and write. She died at the age of 13 in 1903 from Typhoid fever. In 1910 Major worked as a janitor at the state capital. Lucy did washing for a private family. They owned their home free and clear. Major Edmondson died in 1913. I was unable to find a death certificate for him but did learn he was buried in Crown Hill Cemetery. He was 63. His widow Lucy remarried in 1918. In 1920 I found her second husband, George W. Rankin, a widower, living with his adult daughter. I cannot find Lucy so assume she died between her marriage and the census. She would have been in her early 50s. I would have liked to find death certificates for all the members of the family. I would also have liked to find Major in the 1870 and 1880 census. I wonder what took them to New York, how they met and why they decided to move to Indianapolis. The links to people that you find are interesting. Sad that Emma died at aged 13. Yes it is. And two other children died even younger. As usual, those unknown bits between the facts are a story begging to be told. I’m also fascinated that his name was actually “Major.” Was that a common name? I don’t think it was a common name. I knew a man whose given name was “General”. I also like to research friends, associates and neighbors of my ancestors, particularly those who stepped up as Major did, to get a fuller picture of their lives. Have you tried to find a church record for the deaths of Major and Lucy? Sometimes that is the only “death certificate” available. I haven’t tried a church record. I don’t know what their religion was or what church they attended. Most likely it wouldn’t be online, unless they were Catholic. And I have no hints that they were. It was a terrible killer. I read somewhere once,back in the time of segregation and get-off-the-sidewalk, that black people used to give their children names like that so that white people would have to call them a name worthy of respect. I do not know how true that is. Maybe they just liked the names. Ancestry research is an involved art all of its own. I did a little digging into my heritage a few years back but I wasn’t this involved. I just followed the family tree piecing it together. I had hoped to do more but then DH got laid off and I stopped. Perhaps I’ll resume my hunt. It appears that Major and Lucy had one child to live for very long and what a tragedy to lose her at such the young age of 13. Our ancestors could’ve benefited so much from today’s medicine. It’s sad how fragile life was in earlier times. I’m thankful for being born in the modern era of 1961 and today medical technology totally rocks! Thanks for sharing your story of Major and Lucy – very good read and I appreciate you stopping by yesterday to take part in my <a href="Art Sketching Through the Alphabet with the letter “E” (elephant, eagle, elk). I hope you’ll decide to join me again today for the letter “F” featuring fence, frog, fox, & funny face in this series. Happy a2zing! PS: You were surprised to learn there are elk in the mountains of North Carolina. The NPS released them into near Maggie Valley several years ago with great success. It’s a joy to see these critters every chance we get. Ooh, I saw “Major” and I thought he must be a military person. How interesting.